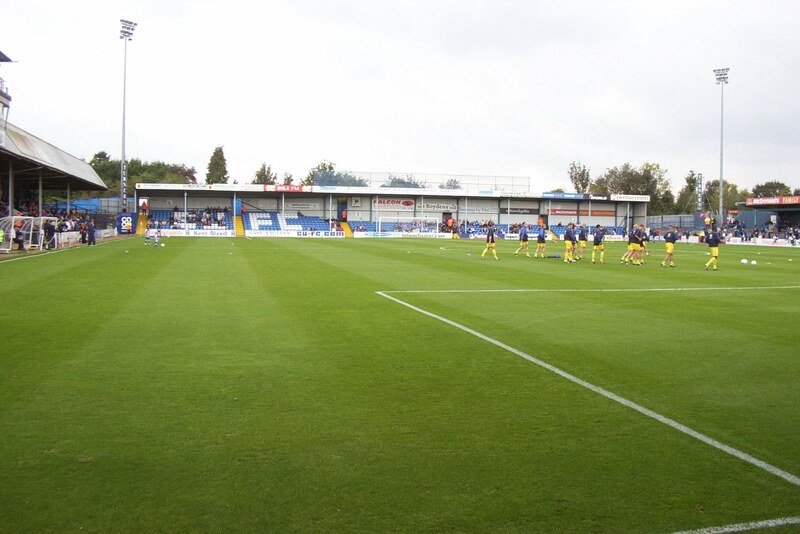 The rivalry between Wycombe Wanderers and Colchester United often baffles fans of other teams, given that they are so far apart geographically. There are a few reports online of the rivalry, but none of them complete or up to date. If there's anything you think is wrong or not included, let me know. 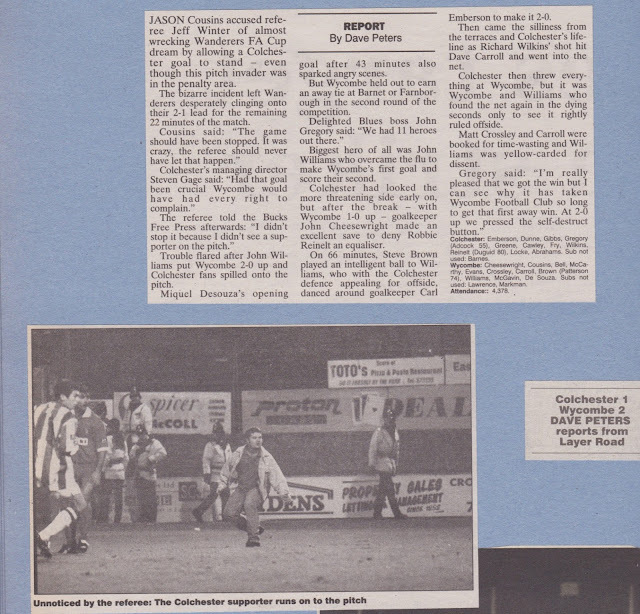 The 1985 match report was a newspaper scan, obtained from Chairboys Archive site, unless stated otherwise, all pictures below are scanned or taken by myself. 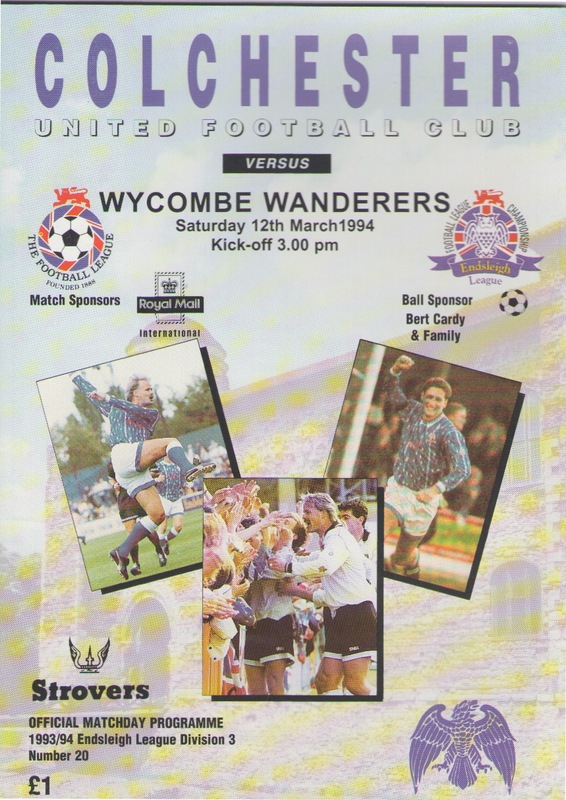 This game was before my time watching Wycombe, but it was the first game between the 2 sides and seems to be a possible start for the rivalry. 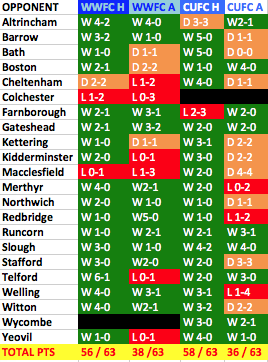 Wycombe were freshly promoted to the Gola League (the name back then for the Conference) but were finding things tough with a 4-0 defeat at Northwich being just one of many bad results. 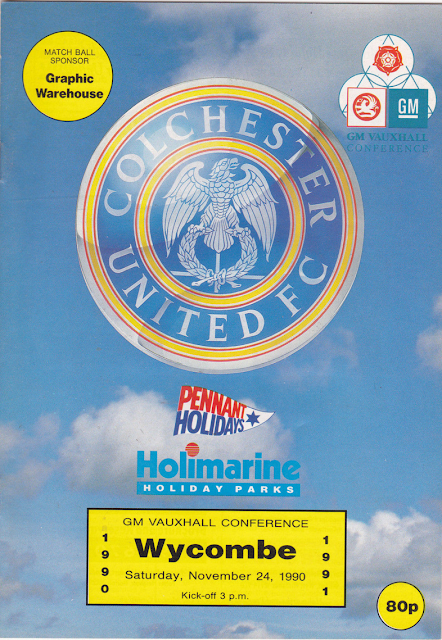 Colchester meanwhile had been riding high near the top of Division 4 a few weeks previously, but a string of poor results had seen them slip to 8th place in recent weeks. Fast forward 6 years and the 2 sides were in the same division. 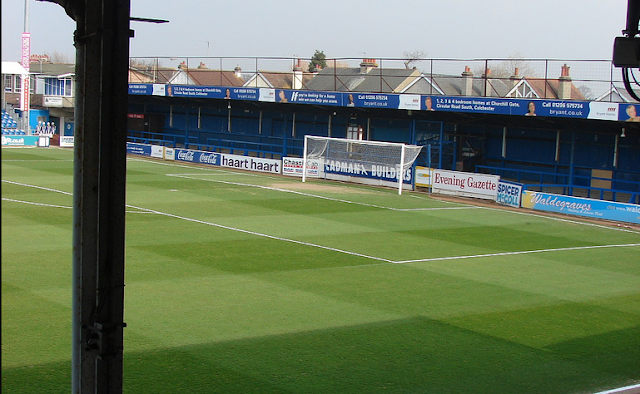 Colchester, freshly relegated from Division 4 the previous season faced Wycombe, rejuvenated under Martin O'Neill. Whilst Wycombe were enjoying their best ever Conference season as well as winning the FA Trophy, Colchester were looking to gain promotion back to the football league at the first attempt. Wycombe did them no favours by drawing at Layer Road and winning the return game at Adams Park. The home game for Wycombe was played on Saturday 28th September 1991, a date that will be forever ingrained on my memory. Before the game Wycombe were 6 points ahead of their rivals, having won 7 out of 8 games in the league so far. With the 2 sides locked at 1-1 in the final minute of the game, Colchester goalkeeper Scott Barrett launched a massive drop kick down the pitch. To the amazement of the crowd, the wind assisted kick bounced once, over Wycombe keeper Paul Hyde's head and into the net to give the Essex side all 3 points. It was a horrible, grotty day, with fog and rain more suited to January, and when he scored Barrett would give the one finger salute to the Wycombe fans behind the goal. This included me, as the sell out crowd meant that my Dad, brother and I had to stand behind the goal, rather than taking our usual seat in the stand. 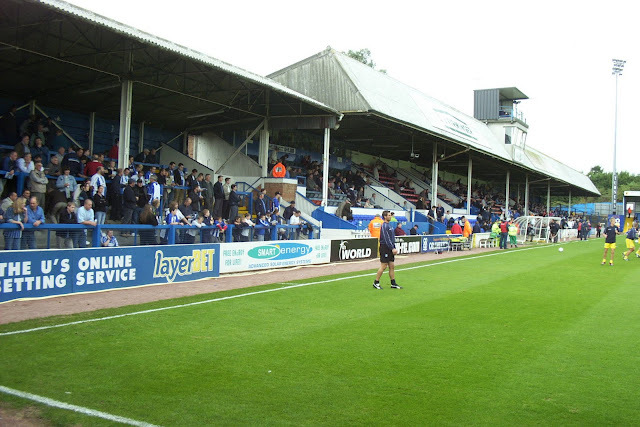 Colchester manager Roy McDonough also encouraged Colchester fans to infiltrate the home terrace in an attempt to cause trouble. Commenting on the incident where Colchester United hooligans attacked home supporters during a Conference championship deciding match in 1992 at Adams Park, he was quoted as saying, "It takes two to fight, one to punch, the other to stand there and be punched." In December the 2 sides met again at Layer Road in Colchester. Wycombe had the better of the opening half hour according to reports but keeper Paul Hyde's nightmare against Colchester continued as he allowed a Gary Bennett shot to squirm under his body to give the hosts the lead, something that Colchester player-boss Roy McDonough took great delight in pointing out to him. 2 further goals including a cracking curling shot from future Wycombe player Steve McGavin would give the Essex side a 3-0 win and allow them to complete the double over us. From a Wycombe point of view you have to feel sorry for Paul Hyde who had a bit of a mare against Colchester, despite almost immaculate performances elsewhere. With 2 games to go the Wycombe had a game in hand on Colchester, 3 points behind but with the Essex side having a 13 goal advantage on the goal difference. Due to fixture congestion Wycombe travelled to high flying Redbridge Forest (later to become Dagenham & Redbridge) needing goals. Some of Colchester's players turned up at Victoria Road, hoping that Redbridge could do them a favour, but it was to no avail as Wycombe raced into a stunning 4-0 half time lead, at which point the U's players left with their tails between their legs. Despite Wycombe piling men forward, they could only get one more goal and so it went to the final day of the season. Colchester faced bottom side Barrow at home, the boastful McDonough claimed that they would be a pushover and he was proved right as his side smashed them 5-0. Wycombe faced Colchester's FA Trophy Final opponents Witton Albion at home, a side which they had lost 2-1 to to end their 20 month unbeaten run in the FA Trophy a couple of months previously. Wycombe triumphed 4-0, not enough to overhaul the Essex sides superior goal difference. 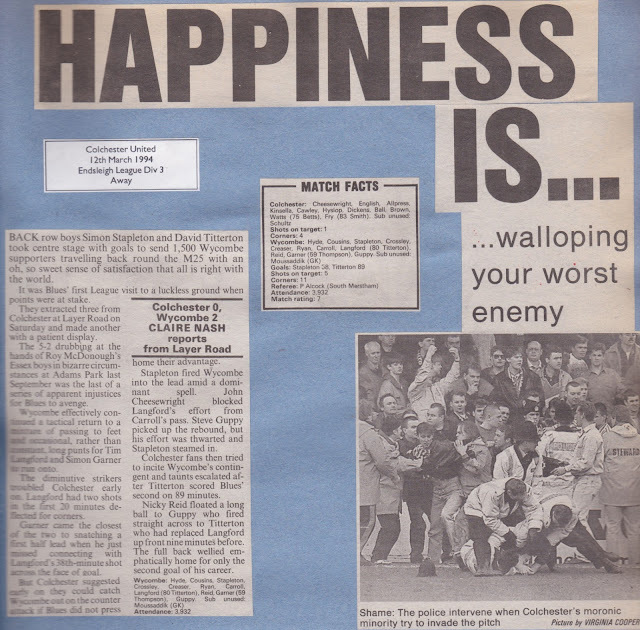 In the end you had to accept that Colchester had been the best of 2 exceptional sides, that finished 21 points clear of their placed Kettering Town. Wycombe would gain a small victory in the Bob Lord Trophy, the competition that was run as a League Cup for the Conference sides. Colchester did not take it seriously at all, and forced to use their first team due to league regulations, played their entire team out of position bar the goalkeeper. On a freezing night Wycombe triumphed 6-2 at Layer Road and Colchester keeper Scott Barrett bought the cold Wycombe fans behind the goal cups of tea. Wycombe would go on to win the trophy, beating Runcorn in a 2 legged final, but in truth it was a fairly insignificant competition in the grand scheme of things. Wycombe would put right the wrongs of the previous season by sweeping all before them to win the Conference title, albeit with a lesser total of points than saw them finish runners up the previous year. The FA Trophy was also won, completing the double, just as their then bitter rivals had done the previous season. 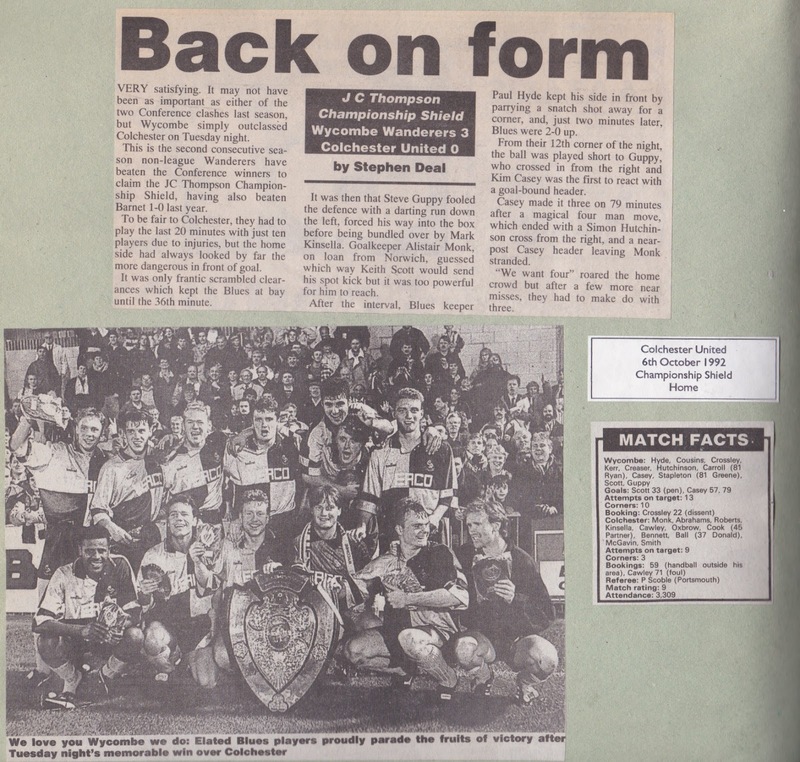 The Conference Championship Shield was won 3-0 against Colchester, gaining another tiny bit of revenge, but the bigger picture was that Wycombe would finally join the Football League for the following season. Wycombe, enjoying an unbeaten start to life in the Football League, welcomed Colchester to Adams Park in September. Wycombe, winning 2-1 just before half time had defender Jason Cousins harshly sent off for a handball on the halfway line. Colchester went on to win 5-2 and inflicting Wycombe's first defeat in the League in the process. 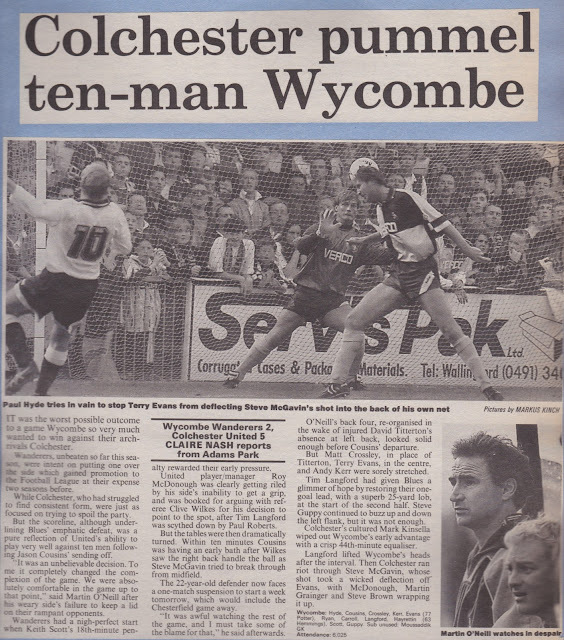 In the January of that year, Wycombe triumphed 1-0 at Layer Road in the Autoglass Trophy, the Chairboys goal being a deflection off Steve Guppy's backside! 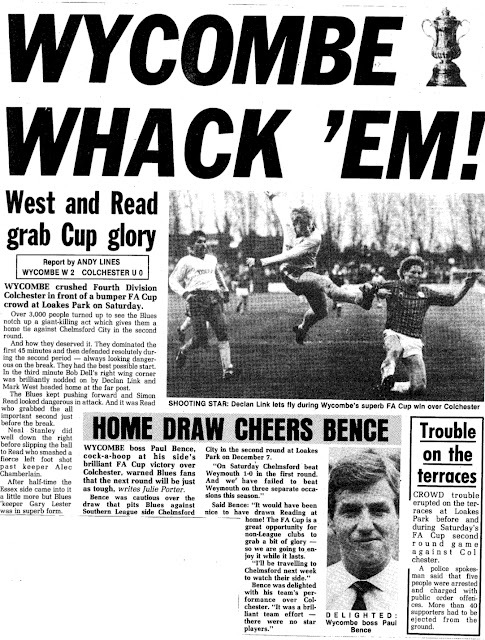 Wycombe also restored parity in the League encounters, in March they triumphed 2-0 in Essex with goals from Simon Stapleton and David Titterton. There again was trouble after the game with Colchester fans invading the away end just before the final whistle and chasing the Wycombe fans out of the ground after also infiltrating the away end. Colchester and Wycombe would meet in the FA Cup 1st Round. 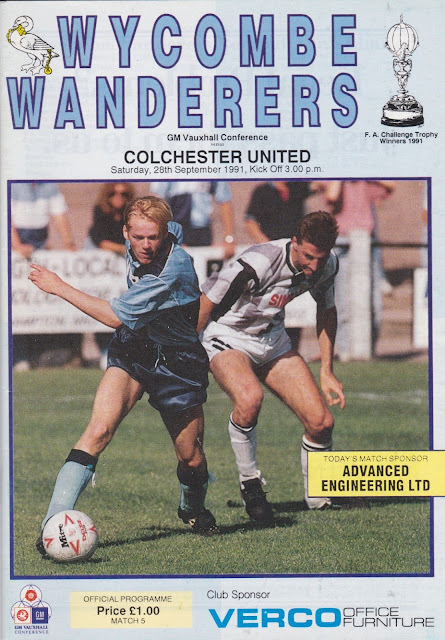 With Wycombe now a league higher than Colchester and chief protagonist Roy McDonough long departed the Essex club, the edge had been taken off the rivalry, but it was still strong enough for minor crowd trouble to ensue. Wycombe's black players suffered racist abuse and objects were thrown onto the pitch. Wycombe raced into a 2 goal lead, courtesy of goals from Miquel DeSouza and John Williams with Colchester replying through a Richard Wilkins effort which was set up by a Colchester pitch invader. 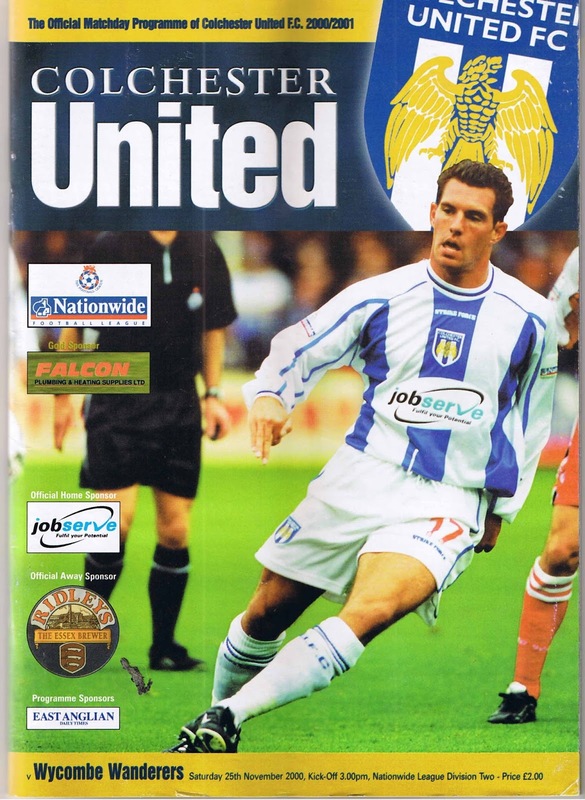 Despite a late rally, Colchester could not find an equaliser and John Gregory's side went on to overcome Barnet in the next round, before a defeat to Bradford City in the 3rd Round. Colchester, finally promoted to the third tier of English football could now renew their league rivalry with Wycombe. They gained the better of Wycombe, winning controversial injury time penalties in each game to win at Layer Road and draw at Adams Park. The home setback came after the referee somehow found NINE minutes of injury time with the penalty coming in the very last minute. 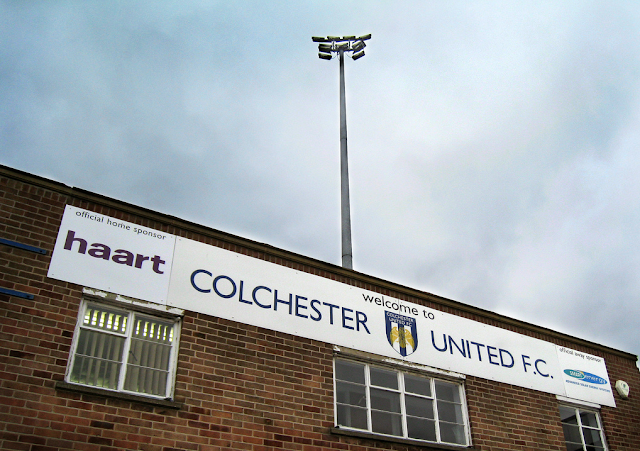 Lomana Tresor Lua-Lua (later to join Newcastle) scores as Colchester win 1-0 at Layer Road. Wycombe are reduced to 9 men as both Michael Simpson and Steve Brown are sent off. Wycombe gain ample revenge by smashing the U's 3-0 at Adams Park, including a 30 yard screamer from Brownie. The following season saw a mass brawl after a bad foul, but the rivalry was fading by now. The rivalry had all but died down now, what with the two sides facing each other less and less often and a series of dour games between the 2 sides culminating in the trouble causing thugs losing interest and the bitterness subsiding. There were some cup games, which although entertaining, passed without controversy. There was one further incident of note in the 2009/10 season with Gareth Ainsoworth's 'Hand of Gaz' goal rescuing Wycombe a point in a 1-1 draw at the Weston Homes Community Stadium, but it was not enough to stop Wycombe being relegated in a period of dominance by the Essex side as far as duels between the 2 sides are concerned. With the rivalry now a distant memory, and the younger fans than dominate the Wycombe vocal support having little idea of what went on years ago, it's hard to see it reigniting to any serious level. As a heavily biased Wycombe fan, I used to think of Layer Road as a complete dump, but retrospectively the groundhopper in me can appreciate that it had some charm. Trouble was rife, especially in the first half of the 1990's, but I never encountered an issue with the fans that I met being perfectly decent people. This was the terraced section for the away fans. Very shallow terracing made it very difficult to get a decent view unless you were very tall. Strangely the terrace was split into 2 which mean that away fans were segregated, despite being in the same stand, presumably to allow more space or to save on stewarding costs, should there be a small away following. Wooden benches make up the seated area of this stand, with terracing on either side. This also provided the seating (unsegregated) for away fans for some time, up until the redevelopment of The Clock End. Under this stand was a hatch which doubled up as a decent programme shop and also a strange setup of tables and chairs, cafe style. This is something I have only seen matched at Southend United's Roots Hall ground, so perhaps it's an Essex thing. 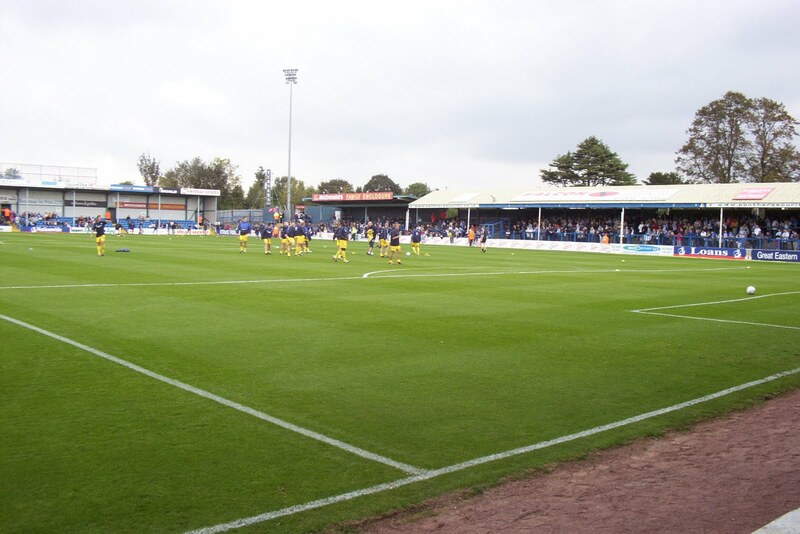 This was probably the smartest area of the ground after it was redeveloped. Originally an uncovered terrace it was turned into an all seated covered stand in the mid to late 90's. Part of this stand provided the away fans seating up until the stadium was demolished, again unsegregated, though as it was mainly families and old people, trouble never occurred.